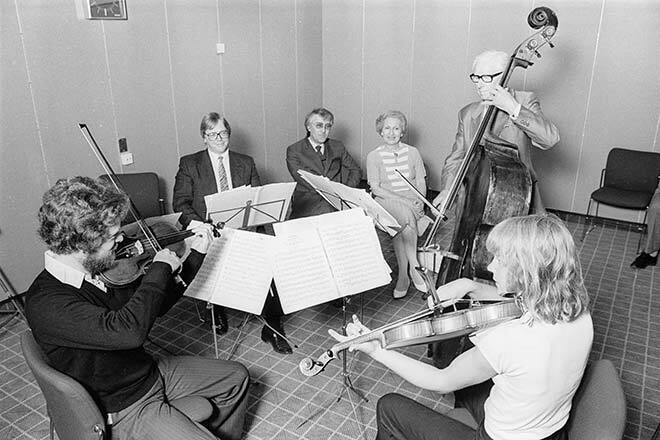 Members of the Wellington Regional Orchestra – from left, violinist and leader Donald Maurice, viola player Rebecca Maurice and double bass player Geoffrey Newson – serenade arts and city council representatives in 1987 after learning that their arts council funding has been reinstated, after intervention by the Wellington city and regional councils. The audience consists of (from left) Arts Council director Michael Volkerling, orchestra board chairman Frank Sviatko and Wellington city councillor Ruth Gotlieb. Funding is a major issue for regional orchestras, which cannot cover their operating costs without being subsidised.